In stock -This product will ship today if ordered within the next 2 hours and 29 minutes. 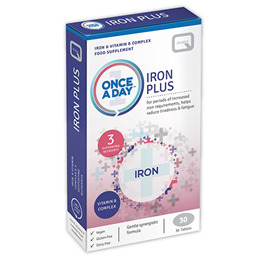 Quest Once a Day - Iron Plus can be used for periods of increased iron requirements; including menstruation, pregnancy and when experiencing fatigue. Take a look at our Quest Platinum Biotix and Quest Super Omega 3-6-9 to find out more about the benefits Quest Excellence products have to offer. dicalcium phosphate, mineral amino acid blend (providing ferrous sulphate, copper sulphate, sodium molybdate complexed with citric acid, glycine, rice flour, rice protein complex, sodium hydroxide, sodium citrate, aspartic acid and maltodextrin), bulking agent: microcrystalline cellulose, ascorbic acid, calcium panthothenate, nicotinamide, magnesium stearate, corscarmellose sodium, thiamin, pyridoxine HCI, vitamin B12, riboflavin, folic acid, methyl cellulose, glazing agent: hydroxypropymrthylcellulose. Keep out of sight of children. Store in a dry place, below 30 degrees. Food supplements should not be used as a replacement for varied and balanced diet and healthy lifestyle. Below are reviews of Quest Once a Day - Iron Plus - 30 Tablets by bodykind customers. If you have tried this product we'd love to hear what you think so please leave a review.